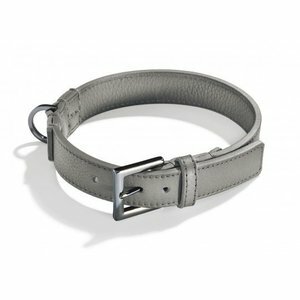 A timeless and elegant handmade dog collar from premium grey double-layered leather with metallic black accessories. 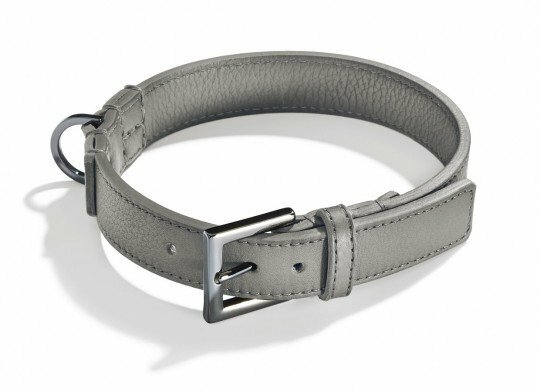 This elegant and timeless grey dog collar is entirely handmade in Schröder's own studio. The collar is made of traditionally strong leather and lined with soft calfskin, also from its own tannery. The use of the premium materials make the collar very soft to the touch. The accessories such as the D ring and buckle are done in black metallic, and these give the collar a very stylish appearance. The leather that is dyed in a traditional way with natural ingredients, which are also used in equestrian sport, ensure that the leather can withstand prolonged use and is virtually indestructible. The collar is impregnated in a special way, so that the collar has an excellent resistance to moisture and dirt. The collar comes with a special care product for long-term protection of the leather.